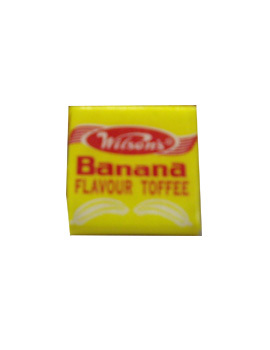 Wilson’s famous chewy banana flavoured toffee. Sugar, Glucose Syrup, Non-Hydrogenated Palm Oil, Corn Flour, Emulsifiers (E322 from Soy), Flavourings, Colourant (E104, E110). the flavour of the banana is really nice! so chewy and full of flavours!! better get some more later :) yum!